Key West National Wildlife Refuge (KWNWR) was established in 1908 by President Theodore Roosevelt. The goal was to protect a variety of Florida birds that were being killed for their feathers. This was during the heyday of the hat making industry, and many species of wading birds at greatest risk. Today, this Florida region provides a safe haven for over 250 bird species, of which the majority are wading birds. This wild bird sanctuary also protects different Florida sea turtle species. Inhabiting and nesting in this wild life preserve are the green sea turtle, the loggerhead sea turtle and the hawksbill sea turtle. The Refuge Visitor Center is located a few blocks north of the traffic light on US Highway 1 at Mile Marker 30, and is at 179 Key Deer Blvd in the Big Pine Key Shopping Plaza. The phone number for the Visitor Center is 305-872-2239. The Refuge headquarters are located at 28950 Watson Boulevard, Big Pine Key, and the phone number there is 305-872-0774. This wildlife preserve is also responsible for the monitoring and recording of the wildlife found within it's boundaries. Management also has the ongoing and difficult task of controlling invasive plant life which tends to run rampant in this warm sub-tropical climate. Like the other 3 protected wildlife preserves in the Florida Keys, this Refuge is administered by the National Key Deer Refuge. The KWNWR covers 200,000 acres of water and only about 2,000 acres of land which is composed of 26 small islands. The land is primarily covered with saltwater mangroves, and the occasional beach. The mangroves are an essential part of the life cycle for the many wading, migratory, and year round birds, while the few Florida beaches provide critical sea turtle nesting habitat. This wild bird preserve lies in direct proximity to the Great White Heron Refuge. and equates to a considerable overlapping of the bird species and sea turtles that frequent both refuges. This expanded territory enhances these protected species ability to more effectively regrow their numbers. 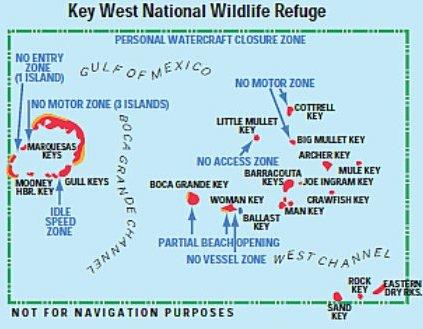 The Key West National Wildlife Refuge is accessible by boat only. Some of the islands are closed to the public, while some in the Marquesas Keys area are open for daytime use only. 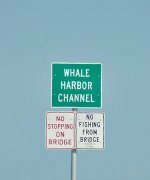 To find out what areas are open to the public, it's best to contact the administrative offices or the Visitor Center before heading out for a day on the water.